What do you give someone who’s turning 75 years old? You want something that is worthy of this momentous occasion; yet you want to give a present that’s unique, thoughtful, and makes you the hands-down winner in any present-giving competition. Don’t worry – you’ll look like the most fabulous gift-giver in the world when you choose one of these unique 75th birthday gift ideas! What Are the Traditional 75th Birthday Gifts? Many people want to know what the official or traditional 75th birthday gifts, gemstones, or colors are. Some of the most popular gifts for a man or woman turning 75 include Day You Were Born gifts, gift baskets, and personalized gifts. There are lists of traditional gemstones, gifts, flowers and colors associated with anniversaries (for a 75th anniversary, those would be diamond and gold,) but the tradition doesn’t carry over to birthdays. The good news is that you are free to choose anything you want without having to keep to a tradition! And just for the record, diamonds and gold do make excellent 75th birthday gift ideas. A lot has changed over the course of 75 years! For a 75th birthday, it's really fun to get presents that remind everyone of exactly how much has happened during the person's lifetime. Who knows history better than The New York Times? Impress the birthday man or woman with a thoughtful gift that features the world's top headlines from America's preeminent newspaper. The Ultimate Birthday Book - Every single birthday front page from someone's entire life - 75 years of headlines! The 140 page personalized book is full of extra details, including a photo-packed timeline and a collection of world-changing front pages. From $155. Front Page Jigsaw Puzzle - Piece together the pages of time with a personalized jigsaw puzzle that features the front page from the day they were born. From $50. 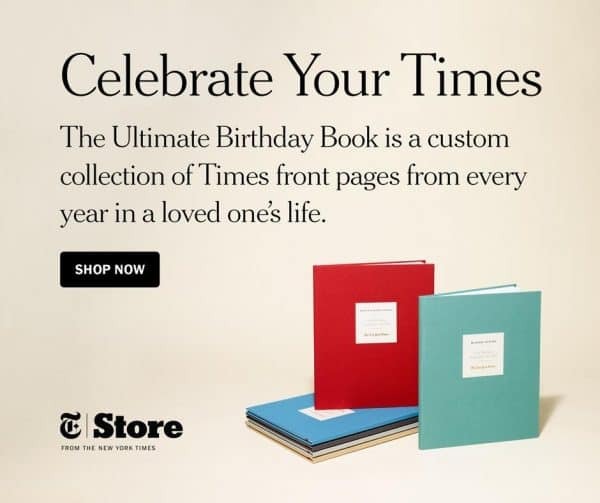 Special Day Book - A complete reproduction of The New York Times from their birthdate. A wonderful glimpse of the headlines, ads, and news from the day they were born. From $100. Front Page Reprint - Commemorate their special day with The New York Times front page reprint. Available framed or unframed. From $60. Everyone’s got to eat! And who doesn’t enjoy getting a scrumptious treat for their birthday? If you have a much-requested treat that everyone loves, consider making that for a gift. Gift baskets are always a wonderful idea for any celebration! Either make your own (check out your local craft store for baskets) with home-made goodies or special treats. If you have a World Market or Trader Joe’s near you, those are good sources of unique goodies to add to the basket. Add a bottle of wine or champagne if you’d like. Or create a themed basket, such as coffee, pasta, BBQ, or chocolate. If you'd like to look online, my ﻿﻿favorite gift basket site is Gift Tree, which specializes in upscale gifts and baskets at very reasonable prices. Remember, sometimes seniors have problems with their teeth, so you might want to avoid sticky foods such as chewy caramels. I’m a huge fan of personalized gifts for any occasion! A personalized gift lets the person know that you’ve gone the extra mile to select a one-of-a-kind gift just for them. They’re especially ideal for a 75th birthday, because many of the personalized presents can be customized to say Happy 75th birthday. I think Personalization﻿﻿ Mall has the best selection of personalized 75th birthday gifts.​ They have a fabulous preview tool which lets you see the personalization before you buy. If you’re on a budget, consider getting a personalized birthday coffee mug – they’re under $15. Other popular personalized gifts include a personalized picture frame, personalized bottle of wine, and personalized keepsakes. This milestone celebration is a perfect time for letting someone close to you, such as a parent or grandparent, know how much you appreciate everything they’ve done for you. They’ll be thrilled to know that they’ve made a difference in your life. Look for sentimental keepsakes that allow you to have a poem or sentiment etched upon them. Or regardless of the gift you choose, take a few extra moments and write an expression of gratitude on the card. Chances are they’ll treasure your sentiments more than the actual gift! If you’re shopping for someone who has had children, family tree gifts are usually a big hit. Any grandparent or parent would treasure a gift that has their loved one’s names on it. Some of the most popular family tree gift ideas include afghans, canvas prints, and platters. For women, you can choose family tree jewelry. Necklaces are the most popular, but you can also find family tree rings that make a unique gift. By the time someone has reached 75, they’ve experienced plenty of photographic moments. Turning a favorite picture into a gift such as a blanket, coffee mug, or canvas creates a one-of-a-kind-gift that will always be treasured. Consider using a picture from the recipient’s childhood. He or should would love to reminisce over a photo gift that brings back memories from long ago. If you have a scanner at home, you can easily scan an old picture into your computer so that you can create a photo gift. If you don’t have a scanner, check your local drug store, Target, or Walmart. Most of these stores have scanners that make it easy to import the pictures. They also usually have a fun selection of gifts that you can order there. You might also think about using a picture of a memorable place. Did the birthday gal or guy live in the same house for most of their lives? They might enjoy having a photo gift of their childhood home, or a photo of their favorite vacation spot. Over the Hill Gifts – Just don’t. When you reach 75, if you’re not over the hill, then you’re getting close. Gifts like that just aren’t quite as funny as they were. Over the hill gifts aren’t really appropriate for this occasion. If you’d like to give a funny present, choose something with a more gentle sense of humor, such as a shirt or cap that says “It took me 75 years to look this good”, or “Aged to Perfection”. CafePress has an extensive selection of humorous gifts for 75 year olds. Homemade gifts are truly a work of love. If you’re the crafty sort, I’m sure the birthday recipient will appreciate all your hard work. I like the suggestions found in DIY Gifts You’d Actually Want to Receive. They’re a bit quirky and many of them look like they would be easy enough for those of us who are slightly craft-impaired.